Just a quick one from me today - I'm currently buried under mountains of Retired Goodies for our Craft Sale on Saturday. I'm pricing everything SUPER cheap this year...I really need to clear some space on my shelves! These are the cards we made in my Stamp-a-Stack Class last week. I finally caved and bought the Guy Greetings stamp set. I needed another masculine set, and this one has some great images and sentiments. 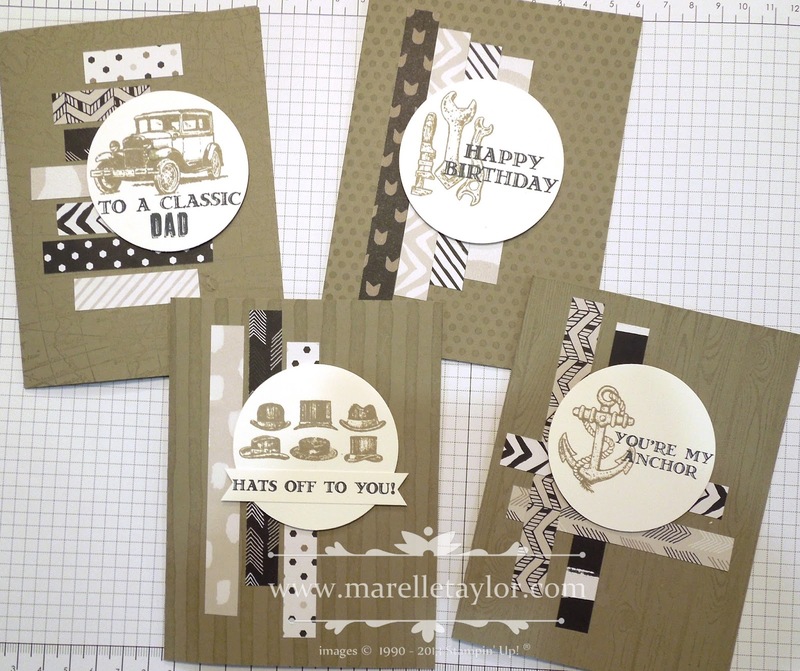 I've also used the Go Wild 6"x6" Paper Stack and Tip Top Taupe as my base colour. You can make a fun background element using just strips of DSP, laid over some subtle background stamping. Now, I'd better get back to pricing my retired goodies! Hope to see you on Saturday.